Sky has admitted that its Sky Go app for Android has been far from great, but promised that it will no longer be treated like the poor cousin to the Apple version of the popular media player, and that also means Android tablet versions are on the way. Sky Go has been a huge hit for Sky, giving customers access to channels they've subscribed to on devices and computers. 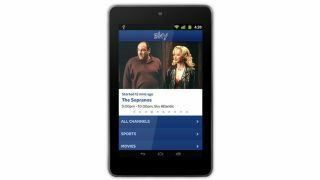 The criticism of Sky's app for Android has been manifold, but the principle complaints include delays in support of Android Ice Cream Sandwich and Jelly Bean, spotty device support (particularly Android tablets) and the length of time between rollouts for iOS and the Android versions. In a candid post on a forum, Sky's MD for product design and development Alun Webber has admitted to the faults of the process and insisted that the company will do better. "I acknowledge that Sky Go on Android has fallen short of the expectations of some of our customers," he wrote. As well as promising that rollouts of the Sky Go app would now be synchronised for iOS and Android devices, Webber promised that support for Android tablets was "the highest priority remaining issue to address". Explaining the issues that have delayed the rollout, including prioritising the (money-making) download service, the need for higher bandwidth to generate a decent picture and the oft-blamed differing screen sizes offered by Android, Webber insisted that solutions were on the way. "[We will be] confirming within 2 weeks our timetable for enabling access to Sky Go on the highest volume Android tablets," he wrote. "[We will also be] ensuring we are well prepared for the next major Android OS release later this year and thereby ensuring customers do not suffer from the same delays as previous releases in terms of having Sky Go supported on the new OS. "With regard to our communications through both the help forum and our customer service teams, I apologise for any frustration you have experienced as a result of not having clear guidance and information available." So, Android users will no longer be the poor cousins to Apple's fanbase - and it's always nice to see a company owning up to its mistakes and trying hard to rectify them.